Interventional therapy is a mini-invasive therapy performed under the guidance of medical imaging equipments. 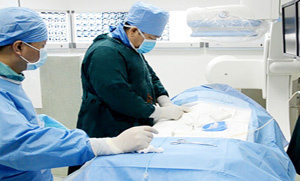 It mainly has two categories: vascular interventional therapy and non-vascular interventional therapy or diagnosis. With a 1-2 millimeter incision, paracentesis could be performed with the lead of medical imaging equipment like CT. Then the special tube, catheter or other sophisticated apparatus are introduced into human body to diagnose the conditions or draw some tissues for topical therapy at the same time or any other time. Interventional therapy is applied vastly in tumor diagnosis and treatments because of its advantages like no operation, small wounds, fast recovery and good effect. medicines are injected into different tumors of various parts of body and embolism is done to tumor and its feeding arteries. Drug concentration of regional perfusion is 2-8 times higher than intravenous drip. Transarterial embolization is to cut off the tumor blood vessels so that the tumor dies out of blood supply; thus, it plays an important role in tumor treatments. Embolic agent can take the anti-cancer medicines to the tumor directly, therefore, the effect will be much higher and will not cause harm to nearby normal organs or tissues. Non-vascular interventional therapy is performed with the guidance of type-B ultrasonic, CT, nuclear magnetic resonance and DSA. This therapy is practicable in many areas, such as biopsy, drainage for liver abscess, stenting (esophageal stent implantation for example) and orientation (like surgical excision for breast lesion under the guidance of orientation), etc. Nutrition and oxygen supplied by blood vessels are the bases for tumor to survive while capillary growing is the foundation for tumor growth. Because there are many blood vessels in a tumor, blocking the blood vessels can control the tumor growing and diffusing, then starve the tumor to death. Antiangiogenic therapy combined with TCM and western medicines can control and kill the rumor by stopping the development of new tumor blood vessels. It features specific targeting, no drug resistance, less toxicity and side effect for some Chinese medicinal components can retard the growth of new tumor blood vessels. Ultra selective arterial embolism and chemo-embolization starve the tumor to death by blocking feeding artery and nutrition supply of tumor with vascular occlusive agent. Occlusive agent combines chemotherapeutic medicines to stop the blood feeding while topical chemotherapy can be taken without side effects like that of whole-body chemotherapy. In order to make sure chemotherapeutic medicine and embolism agent could be injected to tumor lesions, a minimally-invasive intervention doctor should possess following 3 skills: 1. Skilled centesis that can perform puncture exactly in one time. 2. Knows blood anatomical knowledge very well. 3. 3D imageologic foundation. None of these three points can be excluded in interventional therapy. Modern Cancer Hospital Guangzhou possesses all above points to ensure the success of interventional therapy. Interventional Treatment is suit to treat what kind of tumors?